Are you considering installing a split rail fence in Denver? A split rail fence in Denver is a great way to border your yard without loosing your view. Split rail fences can also be effective in keeping small animals in when used with wire. Split rail fences are one of the oldest types of fences that are not only functional but aesthetically pleasing as well. There are a couple things to think about when deciding to install a split rail fence in Denver! Western Red Cedar and Yellow Pine are the best for a split rail fence in Denver. Both are long lasting and can be left to weather naturally or be stained. When considering a split rail fence in Denver you want to make sure that it will meet all of your functional needs. For instance, are you solely using the split rail fence in Denver to delineate your property line? If so, then a split rail fence in Denver will fit the bill! Are you trying to keep small animals or livestock contained? Believe it or not a split rail fence in Denver can do the trick! By going with a three -rail set up with posts placed close together livestock cannot escape. By simply adding weld wire to your split rail fence in Denver, children and small pets can be safely kept in the yard. 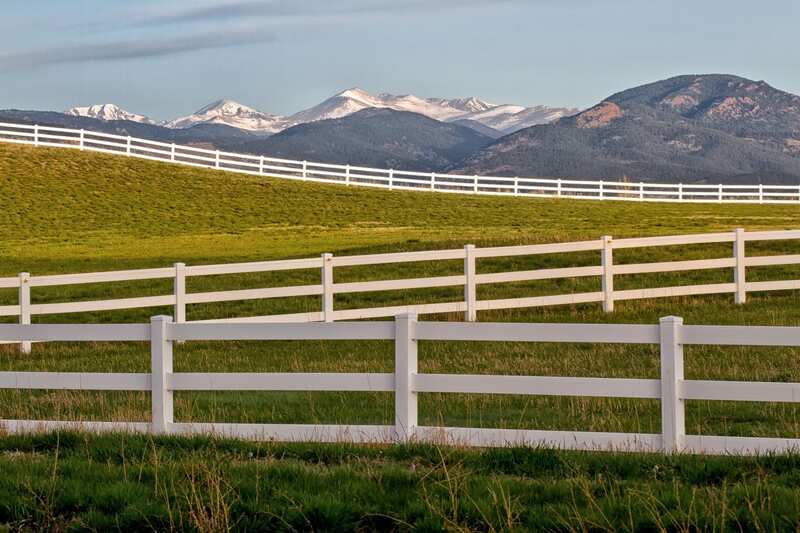 Split rail fence in Denver is durable, visually pleasing, and has many potential uses. Once you are ready to install your split rail fence in Denver you will quickly see that the process is a little different than a fence using metal T posts and woven wire. For example, you will want to make sure that you use a post hole digger to ensure that the posts are far enough in the ground to remain stable. This is especially necessary if you are enclosing livestock that may bear weight on the split rail fence in Denver. You will also need to lay out your split rail fence line with stakes and string to make sure that you are aware of any drastic topographical changes that you will need to account for. These sections will require custom cutting of rails. There are a few variations on the traditional split rail fence that you can choose from. Zig Zag: In this configuration instead of sections running horizontal to each other they can be staggered to create a zig zag. This can give a unique look to your split rail fence in Denver especially if it is just bordering your property. Aged and Rustic: Instead of using the typical post and rails you can use round, rough, and aged rails to get a totally different effect from your split rail fence in Denver. This look is great for a cabin or ranch home. Post Free: With this formation you can replace traditional split rail posts with two rails standing up right and crisscrossed. This is a great look on property with lots of acreage! Designing a split rail fence in Denver can be fun and will be a long-lasting accent to the outside of your home. Although split rail fence in Denver is simple there are many ways to customize it so… do some research before installing yours!